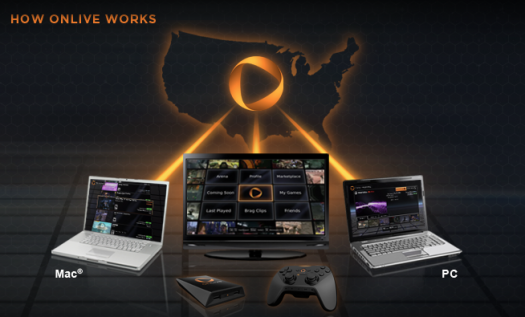 Announced at GDC in 2009, OnLive takes the concept of cloud computing to the next level in providing high-end video games running at HD resolution streamed in realtime over the internet playable on any device capable of running the OnLive client connected to an internet connection with a downstream of at least 5 megabit. Following its announcement, speculation ran wild regarding whether or not this sort of remote technology could even possibly exist and provide the same lag-free experience as a home console. OnLive had an impressive presence at E3 this year, with playable clients running on the OnLive set-top box, Macs, PC’s, and we even got a peek at the games running on the iPad. On a computer or the actual OnLive device, the experience was flawless. According to the people I spoke with at the event, everything we were seeing was being rendered and streamed live from their datacenter hundreds of miles away to the E3 show floor. I’m still skeptical, as the technology as it was presented to me today just seems too good to be true. If a simple set-top box or a client running on a low-end computer can in fact easily stream high-end HD video games for a low monthly fee it really does have the potential to change the face of gaming forever. If this is the first you’ve heard of OnLive, stop by the Wikipedia article and read about it. They cover all the origins of the service, the skepticism, as well as the sheer clout of the executive team behind the company. You can also see the featured OnLive games on the OnLive web site. Today I got a peek at the iPad client for OnLive, something they stressed over and over was not representative of any final product, but rather just exists to serve as an example of how ubiquitous the OnLive service truly is. When a new platform comes along, all they have to do is write a client for it and you will be able to play all of your games live and in the cloud just like you presumably already have been on your TV or computer easily and seamlessly over the internet. Because of its raw tech demo state, the controls are less than ideal. The client uses a weird virtual joystick button layout that I don’t really think would be very useful for anything outside of just demonstrating what is possible. The following video walks through the OnLive iPad client, and shows Borderlands running, an XBOX and PC game. Also, after that, we load up Dragon Age: Origins, which didn’t work because it didn’t have gamepad controls, and finally we spectated on some games in session by other OnLive members. If you watch to the end, you can see a side by side of someone playing a game on the OnLive unit hooked up to an HDTV, that same game is then instantly streamed to both that TV as well as the iPad. The video stream is identical. It really is amazing to see. As explained in the video, they’re not sure when or if the iPad client will even ever be available, but needless to say, we’ve got our fingers crossed. Next PostNext ‘Pro Zombie Soccer’ Review — Let’s sign this guy up ASAP!